Picasion turns images into GIF animations. There’s no need to register, but there are advertisements you may need to be aware of if you use it with kids. Maximum outcome width is 450 px, but you can choose a couple of different sizes and speeds. I tried a test with some LEGO type people from Reasonably Clever's Minimizer. At first I thought I needed to have images of the same size. I deliberately popped a bigger image in, and Picasion modified it to match the rest. It looks like you can only have a sequence of three, but just keep clicking on “add one more image” for more. The result is a scrolling set of images that can be embedded on a blog the way I did below. This could be a very useful tool! You could have GIFs of new book covers in your library blog or web page, screenshots you want kids to see, rotated samples of student work etc. Teachers could use it to share work with parents via the class blog, or publish a collaborative class story. A child could add text to images to compile a short narrative or ad for an event or cause, tell a short story, or show classmates work he is proud of. The embed function is great, but you can get other sharing options too. If you want to avoid Flash or HTML, GIFs are an excellent alternative. 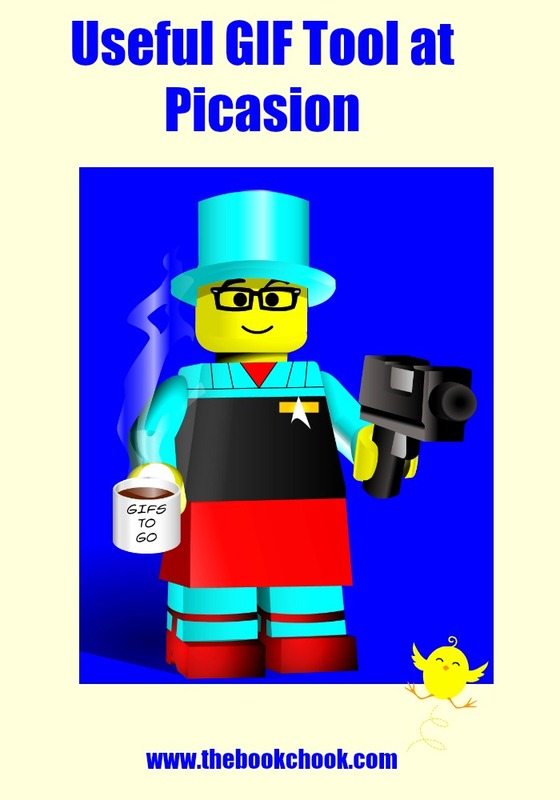 There are other tools at Picasion, glitter text and avatar makers etc, but the GIF animation tool seems the most useful to educators. And easy to use is my kind of web tool!